The European Union (EU) announced on October 5 that Cambodia would lose its special access to European markets under the so-called Everything But Arms (EBA) preferential trade scheme after the bloc launched a six-month review of the county’s duty-free status. Prime Minister Hun Sen, speaking at the Mekong- Japan Business Forum in Tokyo on October 9, invited Japanese firms to visit Cambodia and convince themselves that it a worthy country for their investments. Cambodia is expected to attract 10 million international tourists in 2025 and up to 15 million in 2030, Tourism Minister Thong Khon said on Thursday. A loan by the Australia and New Zealand Banking Group Ltd to a Cambodian sugar company involved in a land dispute was hard to reconcile with the bank’s own human rights standards, an Australian government investigation found. A surge in Chinese investment and in the numbers of migrant workers in Cambodia’s port city of Sihanoukville has left local beaches polluted and Cambodian residents struggling to meet higher prices as the cost of living rises, Cambodian sources say. Cambodian political commentator Kim Sok flew to Helsinki with his daughter on Thursday after gaining political asylum in Finland, following weeks of being in hiding in Thailand under threat of arrest for his criticism of Prime Minister Hun Sen.
Chinese nationals suspected of telecom fraud are escorted into a bus to an airport in Preah Sihanouk province, awaiting deportation to China, in Phnom Penh, Cambodia on Wednesday. Japan is digging in deeper in support of Myanmar and Cambodia even as the U.S. and Europe ramp up criticism of human rights violations, choosing to preserve its influence in the region by playing an alternative to China’s economic might. The walk-in bottle shop might be the only thing that’s the same at the Tennyson Hotel’s second restaurant pop-up. It opens today and we’re very excited. 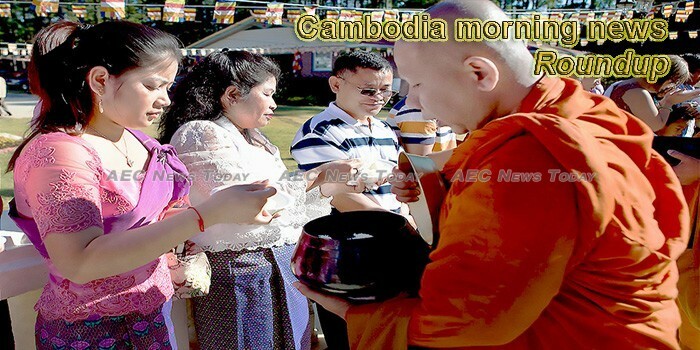 This week’s Cambodia morning news feature photo acknowledges Cambodia Ancestors Day (Pchum Ben), October 8-10.